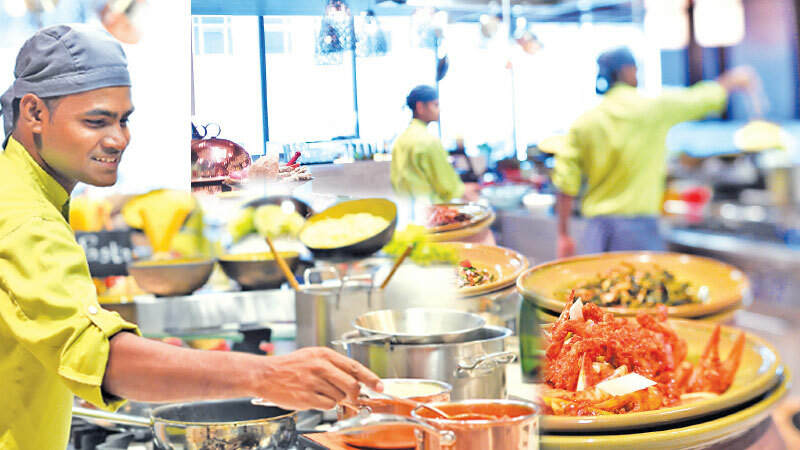 Mövenpick Hotel Colombo’s AYU will offer over 80 different dishes daily serving a bountiful spread of international favourites, the menu focuses on various themes ranging from Italian to Mexican, seafood and Indian on a regular basis. From sleek seafood counters to comfort food, the unlimited offerings boast roasted lamb leg, Jambalaya, Arabic chicken skewers, Beef brisket and expertly prepared renditions of fried chicken to name a few along side live-action cooking stations where you can watch chefs prepare pizzas, pasta, Mongolian rice, fajitas and mouth-watering Kottu to a rhythmic beat. Worried about the calories? The salad bar explores beyond the usual greens with an assortment of grains and pulses. If you’re looking for the best desserts, then AYU has your sweet tooth covered. From Banoffee pies to signature chocolate cake, date pudding, Apple crumble and silky crème brulees, it’s the best way to finish a meal. Also, here’s something we never thought would go well alongside one another – Teppanyaki ice cream! Handmade ice cream at AYU where rolls of ice cream is tucked into bowls topped with a variety of goodies like cookies and candy. After all, ice cream solves everything.